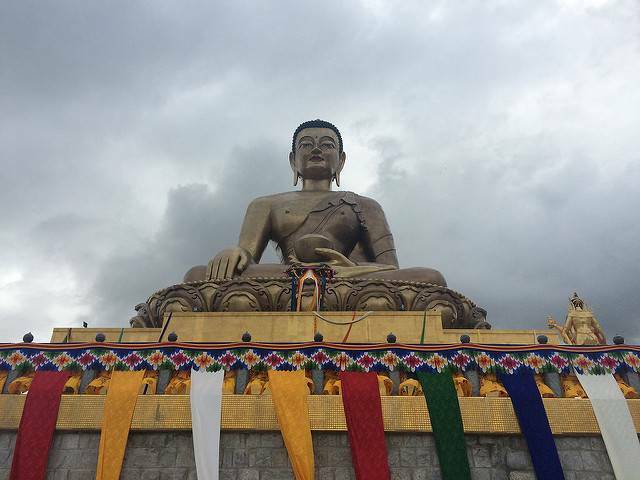 Kuensel Phodrang or the commonly known Buddha Point is a massive structure of seating Shakyamuni Buddha that completed its construction in the recent years is the largest such in the country and one of the largest idols of Buddha in the world. This Buddha is gold plated and made of bronze. It houses one hundred and thousand smaller Buddhas of 8 inches and twenty-five thousand of12 inches height and a diamond is fixed at the point of the third eye. This grand and glorious Buddha can be seen from any corner of the city, this statue sits in the Kuenselphodrang Park upon a meditation hall which serves as a throne to the Buddha. It is the center of attraction to all tourists, radiating its splendor in all directions and harbinger of happiness and peace. It offers the traveler an unparalleled view of the landscape from the top. Kuensel phodrang is the place where the largest statue of Buddha is positioned. Kuensel phodrang is the name of the park where this statue stands. It is commonly known as Buddha Dordenma or Buddha point.